A happy go lucky dog who loves to be active. The Basset Griffon Vendeen Grand are independent and although always aim to please, they aren't naturally obedient so potential owners need patience and tolerance. 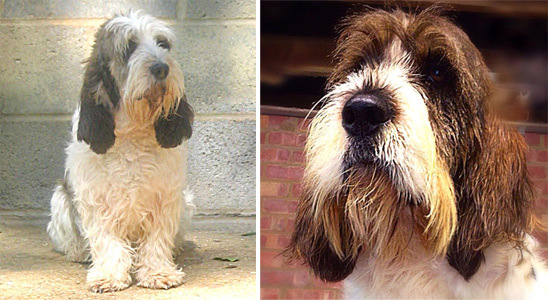 Since the 1970's the breeding of the two varieties of Basset Griffon Vendeen has been separated into two distinct breeds, the Grand and Petit. The Grand Basset Griffon Vendeen is a very intelligent hound bred with the instinct and attitude of his larger cousin, the Grand Griffon Vendeen. Willing to please, but very independent. Unlike his smaller cousin (the Petit Basset Griffon Vendeen, who is more 'in yourface'), the Grand Basset will stand back and question anything new. He is a hunter at heart and will go hunting off lead, but with his superb nose, he knows where his owner is and will return. He must be handled very firmly from a very young age, to understand the boundaries and also where he is in the pecking order in the family. Epilepsy has been known in the breed although selective breeding has reduced the occurrence. They are expected to live for around 12 years. As a breed they prefer cool weather to humid heat. They're not demanding with regard to feeding but for the first year of their lives Grand Basset Griffon Vendeens require an adequate diet to ensure good growth. Quite vocal dogs.